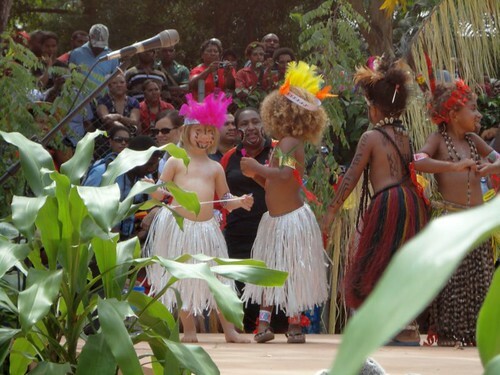 I’m back in PNG after a week in Australia. Two orthopedic surgeon visits, an MRI and an injection later I’m able to mostly walk without pain and am hopeful that things can only improve. I may need another injection in 6 weeks time, but we won’t know that for about 4 weeks. I’ve been instructed to take things very easy for a week (to let the pain be my guide) and to avoid anything strenuous for a month. The staff on the plane going over were most concerned about the cane and the hobbling and provided me with a cushion and a blanket. Since I was wearing summer clothes and the air conditioning was freezing I appreciated the blanket. 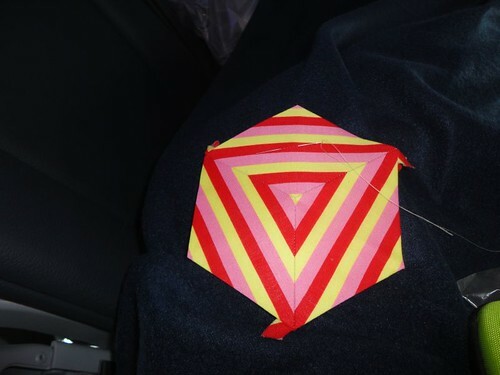 I had three seats to myself and put my foot up and got on with some English paper piecing. There was beautiful colour variation in this yarn. As usual there were lots of books to pick up from my long-suffering sister-in-law who acts as our post box while we are away. There was also some beautiful fibre for me to spin. This is my first yarn/fibre purchase for the year (I’m on a self-imposed stash down) and makes up part of allowable purchases as part of my spin up two lots buy one lot scheme. 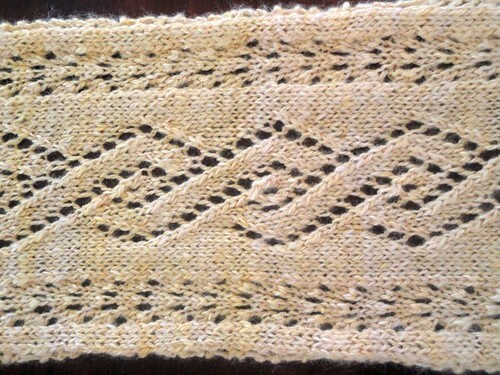 This is wensleydale fibre. My first time to spin this fibre. The test sample I did last night doesn’t have much bounce to it, though it isn’t as scratchy as I was expecting. I’ll try spinning from the fold today and see how that turns out. Any advice on spinning this fibre is most welcome! I also knitted three charity beanies while I was away. I had a fair bit of down time waiting for appointments and stuff, they aren’t very exciting though. Today my mum arrives for a visit for a few weeks so I’m not sure how much crafting I’ll get done. Now that I can stand without pain I’m very keen to cut the fabric for a quilt for my brother and his partner. I’ve had the fabric waiting for a while, but have been unable to get it cut. 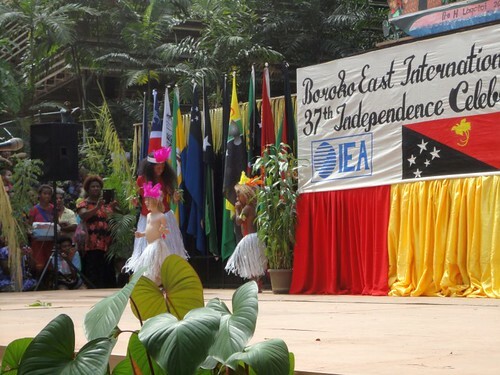 This year Papua New Guinea celebrates 37 years of independence. Gorgeous Girl’s school had a celebration. 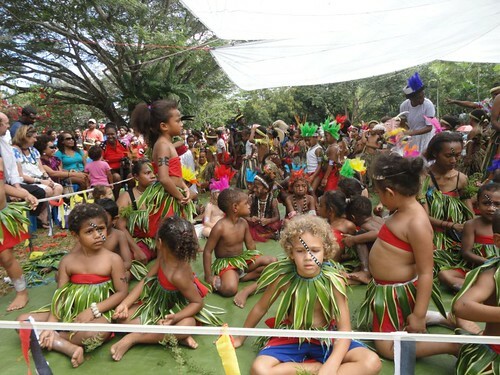 The whole school dressed up in costumes which represented some of the different cultural groups which make up PNG. 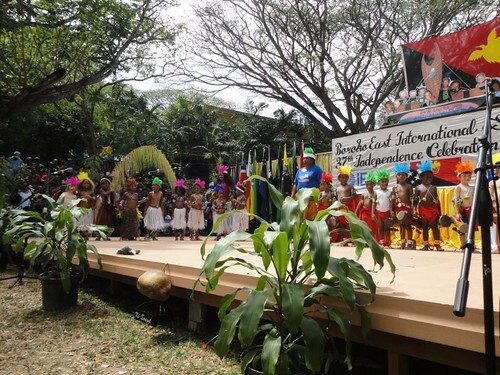 Some of the children supplemented the school provided costumes with pieces from their family. 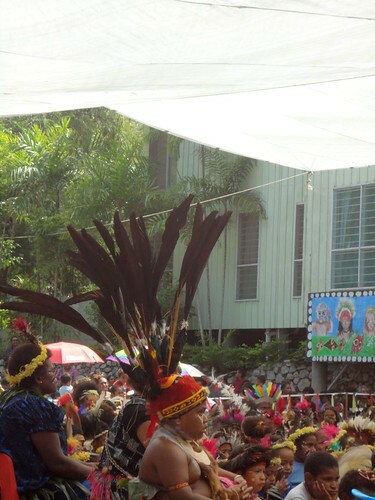 This young lad’s head-dress was particularly impressive. He also had the fur of a cuscus around his neck and a laplap made of woven spun possum fur. Gorgeous Girl was the first one on the stage for her class. I love this cheeky grin. Waiting for the rest of the performances. I love Gorgeous Girl’s school. 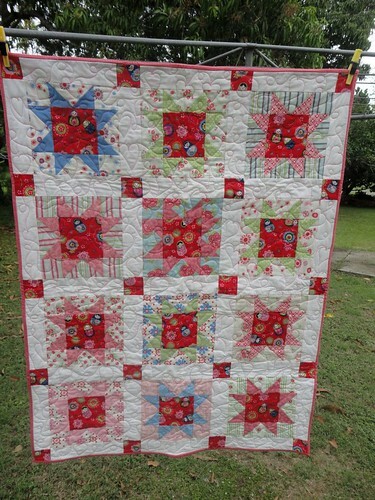 I received this quilt back from the long-armer a few weeks before we packed up the house to leave South Africa. It was carefully put in a box and then I had to wait for nearly 6 months for it to reach us in Papua New Guinea. After unpacking it and looking at the fabric I was planning to use for binding, I realised that it really wasn’t going to work. So on our last trip to Australia I took a small sample of fabric with me and bought binding fabric to match. The red babushka fabric comes from my trip to the Netherlands, where I was lucky enough to meet up with the lovely Helen, who took me to two fabric stores. I’d never have found them without her. The sashing and backing fabric come from my (ex)local quilt store in South Africa. The quilt is a small cot size. Not sure what I’ll do with it just yet. 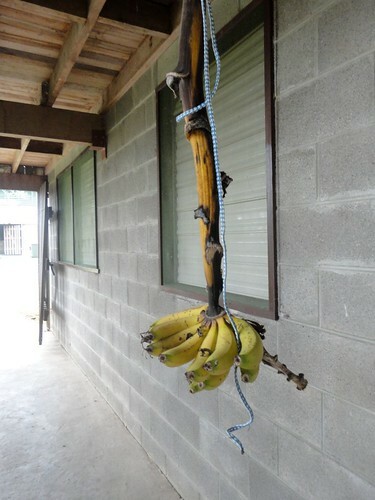 We are down to our last few bananas. This is all that’s left after eating lots, giving some away to neighbours and freezing some for cooking. After these are gone it will be back to buying the tiny bush bananas for sale on the driveway of the local supermarket. September and October are the birthday months in our family. Gorgeous Man’s birthday is in September and Gorgeous Girl and I have birthdays in October. In addition, there are another 6 birthdays within the wider family in these two months. So I sat down recently and made some cards. 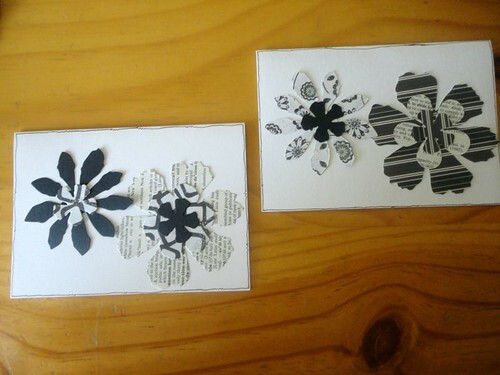 Special thanks to Rochelle who let me borrow her die-cutting machine and raid her scrapbox for paper when we were in Australia at the beginning of the year. 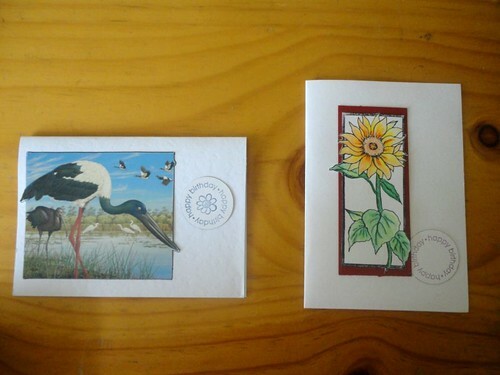 The card on the left is upcycled from an old calendar. The image on the right is coloured using my watercolour pencils. I love the effect they provide. 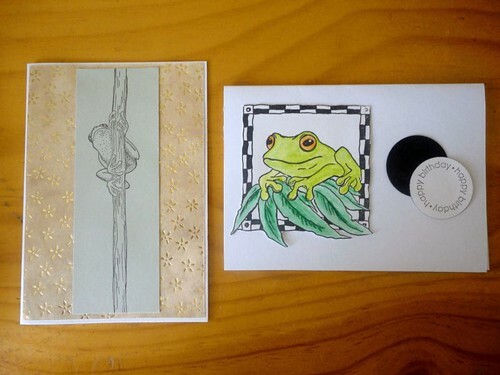 The image on the left is a stamp I always stamp a few of when I visit my step-mother-in-law (guess I should think about tracking it down and buying one of my own since I use it so much) and the one on the left is from my sister-in-law’s scrapbox and coloured with water colour pencils. Pages from and old dictionary and offcuts of scrapbooking paper. Only 5 more days and I’ll be in Australia for treatment for my foot. I cannot wait to be able to walk again without pain. I’m really hoping the orthopedic surgeon will have a good prognosis and treatment option for me. 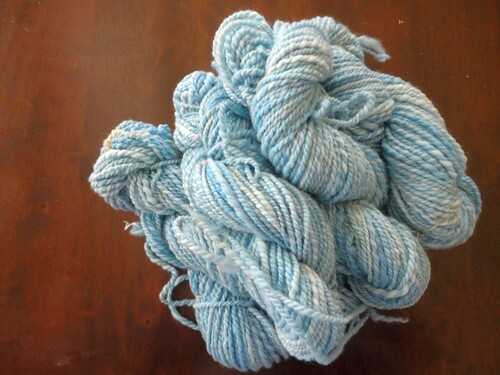 This yarn is the summary of several months worth of spinning. It was spun on the Ashford Traditional and plied using my left foot to treadle as my right one is no longer working properly. I find treadling with my left foot awkward, so there isn’t much spinning going on at the moment. I do have a double treadle wheel, but that is too painful to use at present, and a certain Gorgeous Girl has it full of her yarn in progress. 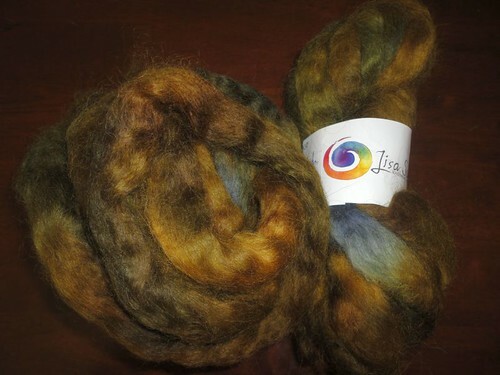 This is from fibre that I dyed myself when I first started spinning. It was pretty matted and felted, so there was a fair amount of fibre loss. 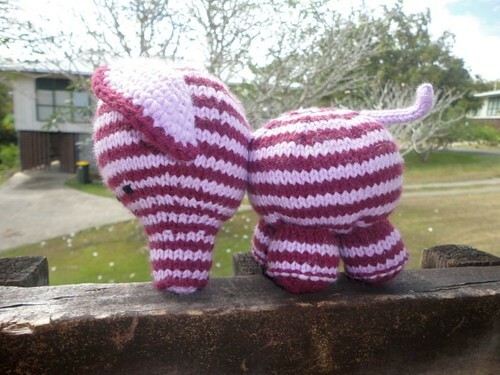 The unspinable fibre will be used to stuff soft toys. Yesterday I was working on getting some fabric ready to be paper pieced and Gorgeous Girl wanted to craft too. 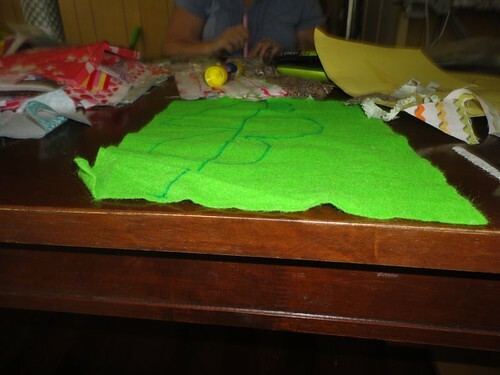 So she chose some felt from the stash (I stocked up on felt before leaving South Africa and got more when we were in Australia, it’s a good craft basic to have if you have small kids). She then borrowed my Sharpie pen and got to work. When she was done she asked to borrow my camera and took a picture. It’s a butterfly. She also used my tiny fabric scraps to glue onto cardboard to make a collage. I sewed down the last bit of binding for a quilt last night, but that deserves a post of it’s own, and my foot needs to feel well enough for me to go outside and photograph it. The good news is that I now have my plane ticket and appointment to go and see the orthopedic surgeon in Australia next week. I cannot wait to be better and go for a long walk. 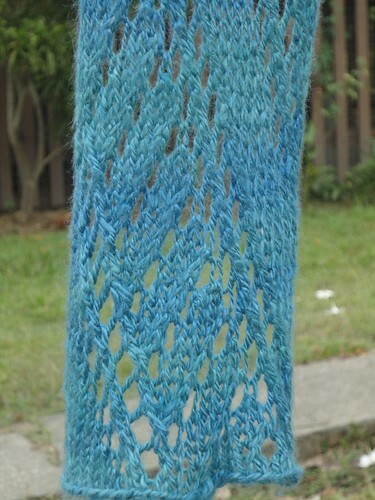 Another scarf finish. This is Diagonale. 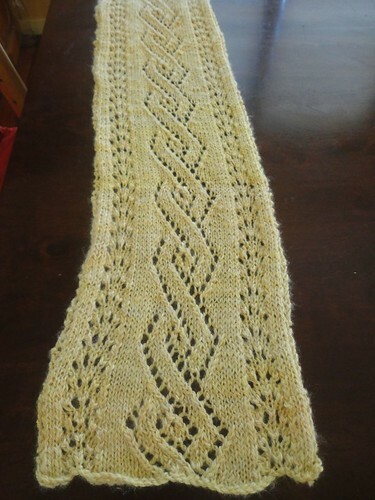 The pattern is for a stole, but since I only had a small amount of yarn I limited the number of repeats and made a scarf. 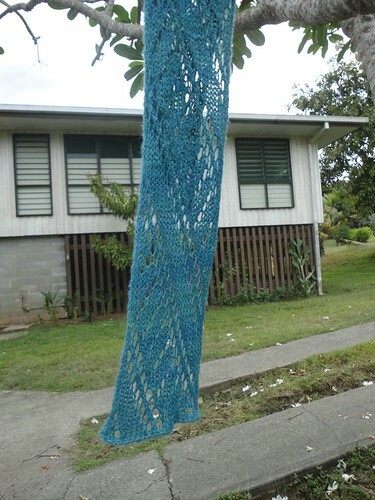 The yarn is handspun seasilk. (The fibre is made from seaweed). 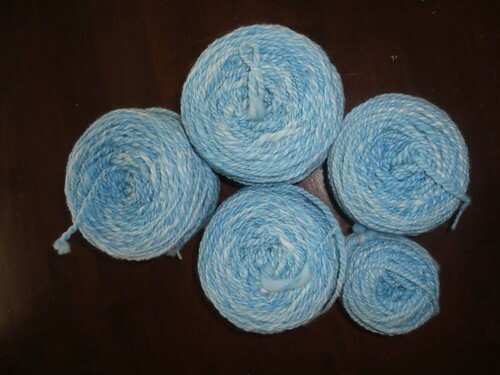 My limited photography skills don’t really show up all the lovely colour variations in the yarn. I’m hoping it will still be cool enough to wear this when I head to Australia late next week. 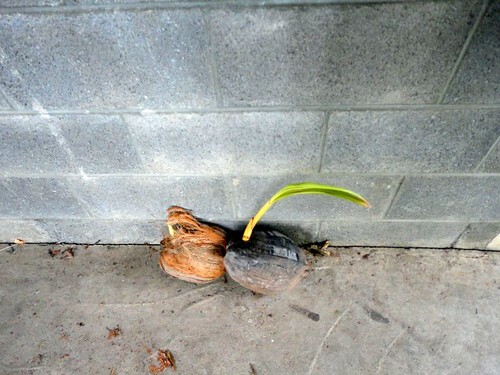 Finally, if you leave a coconut long enough this happens. There are two that are sprouting. We’ll find a suitable place in the yard and plant them and watch them grow. 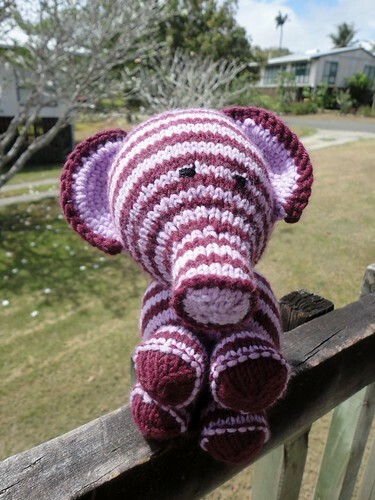 Recently Gorgeous Girl spotted Elefante (Ravelry link, non-Ravelry link here) in my Ravelry queue and, after looking at the projects pages together, she requested one in purple. Her wish is my command (at least when it comes to knitting). The face came out a little bit wonky and I think s/he (still haven’t decided on gender) seems a bit sad. It was a relatively fast knit and not terribly fiddly to put together, though attaching the ears and the head did give me some trouble. I have an appointment in Brisbane with an orthopedic surgeon in the middle of this month. I’m disappointed I have to wait for a few more weeks, but am extremely excited to be getting my mobility back. I’m very tired of hobbling around.